An intentional community is a group of people who have chosen to live or work together in pursuit of a common ideal or vision. 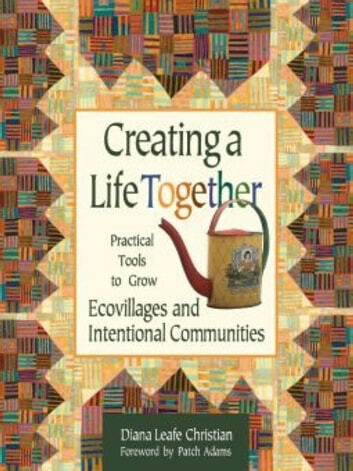 An ecovillage is a village-scale intentional community that intends to create ecological social economic and spiritual sustainability over several generations.The 90s saw a revitalized surge of interest in intentional communities and ecovillages in North America: the number of intentional communities listed in the Communities Directory increased 60 percent between 1990 and 1995. But only 10 percent of the actual number of forming-community groups actually succeeded. Ninety percent failed often in conflict and heartbreak. After visiting and interviewing founders of dozens of successful and failed communities along with her own forming-community experiences the author concluded that "the successful 10 percent" had all done the same five or six things right and "the unsuccessful 90 percent" had made the same handful of mistakes. Recognizing that a wealth of wisdom were contained in these experiences she set out to distill and capture them in one place.Creating a Life Together is the only resource available that provides step-by-step practical "how-to" information on how to launch and sustain a successful ecovillage or intentional community. Through anecdotes stories and cautionary tales about real communities and by profiling seven successful communities in depth the book examines "the successful 10 percent" and why 90 percent fail; the role of community founders; getting a group off to a good start; vision and vision documents; decision-making and governance; agreements; legal options; finding financing and developing land; structuring a community economy; selecting new members; and communication process and dealing well with conflict. Sample vision documents community agreements and visioning exercises are included along with abundant resources for learning more.